What is the difference between CGM and BGM? Blood Glucose Meters (BGM) measure glucose levels at a single moment in time, while Continuous Glucose Monitoring (CGM) systems continually check glucose levels throughout the day and night. BGMs are only capable of generating a single glucose level reading, while CGM systems use data gathered over the course of an entire day and night. Since CGM systems collect measurements 24/7, they provide dynamic information about the direction of glucose levels and rate of change. This level of proactivity is not possible with BGMs. CGM systems help to minimize the guesswork that comes with making treatment decisions* based solely on a number from a blood glucose meter reading. The way measurements are taken is different between the two methods. BGMs require a fingerstick while CGMs place a sensor under the skin while connecting to a transmitter which continuously sends regular intervals of glucose readings to a receiver or compatible smart device via bluetooth technology. Unlike BGMs that require deliberate action to get a reading, real-time CGM systems work throughout the night, while the user is asleep. Some of the latest advancements in Continuous Glucose Monitoring (CGM) systems eliminate the need to take fingerstick measurements using a Blood Glucose Meter. * Other CGM systems reduce the frequency of fingersticks, but still rely on regular Blood Glucose Meter readings to ensure proper calibration. It is always recommended that CGM users take a fingerstick reading prior to making diabetes treatment decisions if glucose alerts and readings from their CGM systems do not match symptoms or expectations. *If your glucose alerts and readings from your CGM do not match symptoms or expectations, use a blood glucose meter to make diabetes treatment decisions. 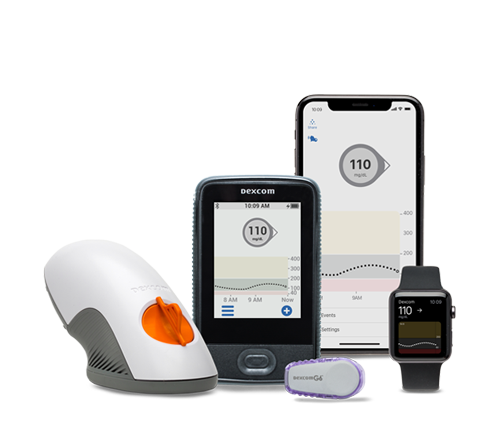 * If glucose alerts and readings from a CGM do not match symptoms or expectations, use a blood glucose meter to make diabetes treatment decisions. 1 Soupal J, Petruzelkova L, Flekac M, et al. “Comparison of Different Treatment Modalities for Type 1 Diabetes, Including Sensor-Augmented Insulin Regimens, in 52 Weeks of Follow-Up: A COMISAIR Study.” Diabetes Technol Ther. 2016;18(9):532-538. 2 2015 AACE/ACE Guidelines. Endocr Pract. 2015, 21. Vol 21 (5) pg. 522-533.